The undergraduate and graduate programs at the LSU Robert Reich School of Landscape Architecture (RRSLA) have once again received top rankings from DesignIntelligence magazine, the leading journal of design professionals. The 2017–18 issue of “America’s Best Architecture & Design Schools” ranked the undergraduate program as number one in the nation and the graduate program as number three in the nation, up three spots from last year. LSU’s landscape architecture undergraduate program has been consistently ranked in the top two in the nation for well over a decade; the 2017–18 ranking is the eighth time the undergraduate program has held the number one position since 2006. The graduate program has also been ranked within the top six in the nation for over 10 years, sharing top rankings with Harvard, Cornell, the University of California, Berkeley, and the University of Pennsylvania. LSU is by far the most affordable graduate program of the top three. DesignIntelligence’s research ranks undergraduate and graduate programs from the perspective of leading practitioners. Each year, approximately 3,000 hiring professionals from more than 2,000 professional practice organizations participate in the research and are asked to rank the accredited schools best preparing students for success in the profession and for designing a sustainable future. Firms are queried about additional issues, as well, such as how programs rate in teaching various skills, such as communication, computer applications, construction methods and materials, design, planning, research, cross-disciplinary teamwork, sustainable design practices and principles, and theory. Surveys for “America’s Best Architecture & Design Schools” are conducted annually by DesignIntelligence on behalf of the Design Futures Council. The research ranks undergraduate and graduate programs from the perspective of leading practitioners. Survey participants are professionals in architecture, industrial design, interior design, and landscape architecture, drawn from the Greenway Group database of leading firms throughout the United States. Visit di.net to for a complete list of design school rankings. The Robert Reich School of Landscape Architecture has established an international reputation as one of America’s leading and consistently top-ranked programs. Part of the LSU College of Art & Design, the school offers Bachelor of Landscape Architecture and Master of Landscape Architecture programs. 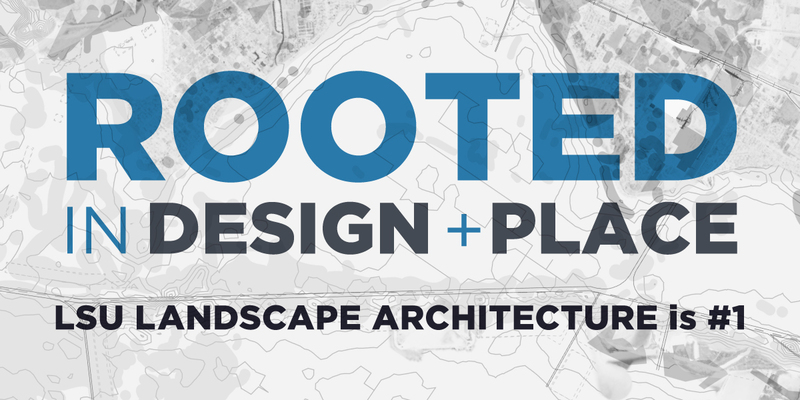 For more than 70 years, the program has produced landscape architects who practice all over the world and participate in the full spectrum of the discipline. For more information, visit landscape.lsu.edu.